Onycholysis is a common disorder affecting nails. The condition is marked by splitting of the nail bed, of the finger or the toe, from the nail plate. Usually, the nail plate remains attached to the nail bed. But this condition loosens the nail and it starts coming out from the nail bed. The nail starts taking the appearance of a half-moon and its free end begins to rise up like a hood. Onycholysis can affect people of any age group and gender though it is more common in adults, especially females. It affects women more than men. One can see few cases of Onycholysis in children. Onycholysis is also known by the name “Brittle Nails”. The proper way of Onycholysis pronunciation is by spelling the condition as “Oni-koh-li-sis”. Onycholysis is mainly characterized by the detachment of the nail plate of the finger or toe from the nail bed. The nail plate is the hard substance that covers and protects the top of the fingers and toes. When the nail starts coming off from the nail bed, the raised part looks white as there is only air between the bed and the nail. Onycholysis of the nail can be quite discomforting and painful. Pain can be acute in cases of infection. An Onycholysis nail can impair activities and cause problems in walking and eating. Onycholysis untreated can turn infectious. Over time, water, keratin debris, dirt and germ find their way under the nail inviting bacterial, fungal or yeast infection. 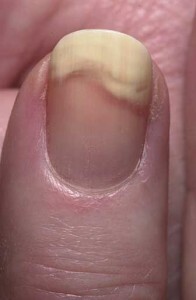 The white nail Onycholysis appearance begins to appear yellow or creamy. In most cases Onycholysis causes infection. This can, however, be avoided with immediate treatment. Unless treated in time, Onycholysis can give rise to abscesses in the nail bed. It may release pus from time to time. The entire region can pain for long. TraumaImproper manicuring of the nails is often seen as a cause of Onycholysis. Over-trimming of the nails can expose the nail bed and may also result in lifting of the nail plate. In Onycholysis trauma of the nails is often the main cause. Wearing very tight-fitted shoes make the feet sweat and put the toenails under stress for a long time. This can lead to Onycholysis in toenails. Hyperactive ThyroidOver secretion of the thyroid glands can also result in Onycholysis. Iron DeficiencyDeficiency of iron in the body can sometimes give rise to Onycholysis. Skin AilmentsSkin problems like eczema and psoriasis can also act as causative factors of Onycholysis. The skin around the nail and cuticle turns dry and flaky in such cases. IrritationExposure of the skin to an irritating substance can also give rise to Onycholysis problems in the nail. Certain chemicals in nail polish can be allergenic for the skin and produce harsh symptoms causing the nail to separate from the skin. MoisteningIn Onycholysis separation of the nail and nail bed can occur due to long exposure of the surrounding skin to water. MedicationOnycholysis can also arise as a side-effect of certain medications. Tiny, white marks may appear on the nail as a result. In Onycholysis chemotherapy medications, Tetraycline drugs and medicines containing Vitamin A are often found to be causative factors. PsoriasisIn Onycholysis Psoriasis is often a main cause. Psoriasis is a chronic skin disorder. When the disease affects skin of the fingers and toes, the nails can be seriously affected. In advanced stages, the entire nail can come off from the bed. Onycholysis in psoriatic fingernails can be quite difficult to treat.